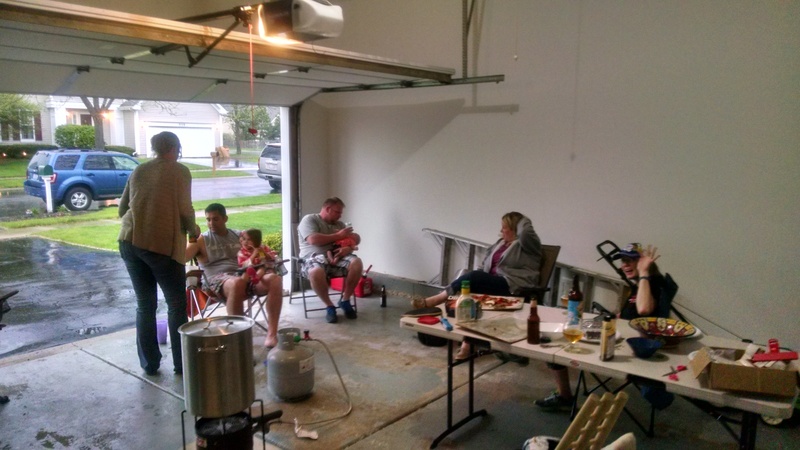 This past Sunday, May 3rd, I brewed one of my favorite beers! 527 is a DIPA that I change the recipe for every year, and its a fun way to try out things that I’d like to work into my regular batches. If I love the recipe, I may rename it and brew it in my regular rotation. For those that missed last years entry for this beer, 527 Celebration Ale is named for my wife, Kristin, and my anniversary date, May 27th. With this year’s recipe, I wanted to focus on the mouthfeel of the beer, as well as big juicy hop flavor without a lot of bitterness. My inspiration for this has been some Northeastern beer that I’ve had lately. I’d had Heady Topper previously, but I’ve now had several beers from Hill Farmstead, Trillium, and Treehouse. A few of my very generous friends took a road trip out east and brought me back a whole bunch of amazing beer. What a lot of these beers have in common is a creamy mouthfeel and huge hop flavor and aroma. The fruitier hops in some of these beers combined with the creaminess gives them a thick juice like quality that is just awesome. I wanted to do that with my latest 527. I wanted a DIPA that I knew I’d like, but would be different enough from my White Death which is also a Northeast style DIPA. I looked into what may be some of the secret to achieving these qualities, and I turned to two of my favorite blogs. Meek Brewing Co and Bear Flavored both wrote great articles on this topic, so I won’t go into a ton of detail here. The basic gist is they focus on the use of higher chloride in the water, and rumor has it that might be one of the larger factors that give Hill Farmstead beers the mouthfeel that they have. The two articles linked also talk about using Wyeast London Ale III. I was tempted to try this, but I love Conan yeast and I find it does lend a nice mouthfeel to the beer as well. I decided to focus on higher chloride water for this beer, as well as a ton of late and dry hops. I also kept the malt bill really light since I love the blonde IPAs that are coming from that part of the country. I used Pilsner malt for the first time in one of my hoppy beers. I kept it to 6 pounds in this one, but I might have to go full Pilsner malt as the base on a DIPA soon. A word of warning here about the Pils malt: I did not do a 90 minute boil. I had a very strong boil going the whole 60 minutes, and I figure at a bit less than half the grain bill it wasn’t necessary. I’ll find out if I can detect any DMS, but I’m not expecting that to be a problem. If I do use only Pilsner malt as a base, I ‘ll be sure to do 90 minutes. I used a pound and a half of oats in this bad boy, plus a pound of wheat. This beer had better be creamy and silky smooth! I decided to go with three of my favorite hops in this beer: Simcoe, Citra, and Mosaic. There’s a couple beers from one of my favorite local breweries, Pipeworks, that uses that hop combo and those beers are crazy good. With those hops, you should get a bunch of citrus, some tropical fruit, some pine, and a bit of dank. My mouth is almost watering just thinking of it! As excited as I was about this beer, if I had one word to describe the brew day it would be….dammit. After messing up the hopstand a bit on my Attack and Release a few weeks ago, I was determined to have a brew day go off without a hitch. Well, needless to say that didn’t happen. As usual we had some friends and family over. I had a few beers of course, but less than usual and I really wasn’t distracted by the fun I was having. I realized my problem: I am not an organized person! So here’s what happened. I went take my gravity sample and it read 1.074. I was shooting for close to 1.080 for this beer. No problem I thought, I’ll add some DME. Well, after four ounces of DME added, I look in my ingredients bag from the LHBS and see the 10oz of corn sugar I forgot to add. Dammit. I also see three unopened bags of hops. Where the hell did those come from I thought? Then it hit me: I forgot to add them to the hopstand! Dammit!!! I had measured out the .5oz I needed off of previously opened bags from the 5 minute additions, and I forgot to add the other 3oz! So my hop stand only had 1.5 oz for 45 minutes at 180 degrees. My solution was to take a couple cups of water, add 5 oz of corn sugar, bring it to a boil, cool it a bit, and then steep my remaining 3oz of hops. I then added that all to the fermentor. I’m hoping that regained some of the hop oils I missed out on during the hopstand. I have no idea if that will make up for what I lost, but we’ll see! Moral of the story is I really need to lay all my ingredients out in order on a table at the start of brew day so I can’t miss anything. The recipe shown here isn’t exactly what I originally planned as it includes the DME and less sugar, but this is what I brewed. On 05/12/15, I transfered this bad boy into the keg for the second round of dry hops. I put the first round in after about five days in the fermenter. The thought here is that the yeast for the first round of dry hopping should be somewhat active. You might lose a bit of the aromatics from this first round to the Co2 still being scrubbed off, but the yeast will still use any oxygen in the hops. I like this because its one less way to oxidize my hoppy brews. The second round of dry hops was done in the keg. 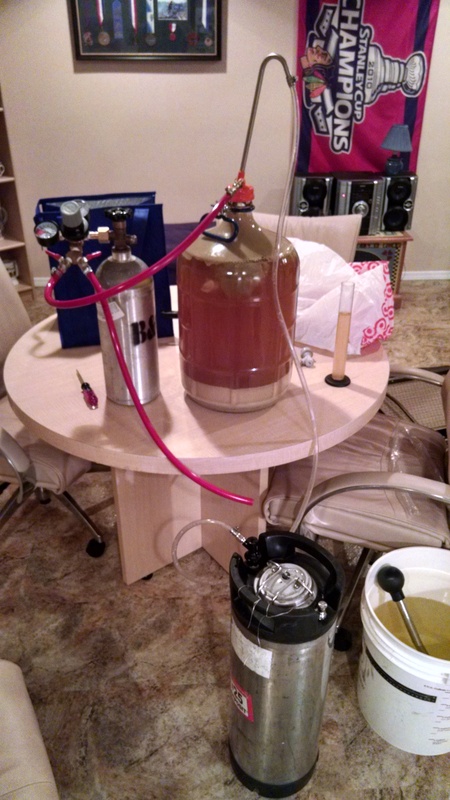 You’ll notice I transferred to my keg via a closed system under Co2. I’ve been reading up a ton on this topic, and I really think it’ll help keep the flavors and aromas of the hops bolder for longer. I’ll probably do a full write up about closed transferring soon, so I won’t go in depth here, but its a method I plan on using to transfer any of my delicate or hop forward beers. My FG hit exactly where I wanted it at 1.016. I don’t usually down the entire hydrometer sample, but damn this beer is already shaping up to be VERY tasty. Without carbonation the mouthfeel isn’t where it will be, but it already had a smoothness that I don’t recall in my other IPAs. I’m going to start carbonating this beer on Saturday, 05/16, and I’ll post tasting notes around the end of the month! Tasting on 06/01/15: I turns out that I was worried for nothing after my mistakes on brew day! This beer turned out to be one of the best I’ve done. Between the solid recipe, kegging, and the closed system transfer, the flavors and aromas of this beer are some of the best I’ve gotten in my homebrews. Also, this beer has held up better than any light colored IPA I’ve brewed to date. This is right around the time my prior batches of DIPA have dove off a cliff, but this beer shows no signs of oxidation or decrease in the good stuff. 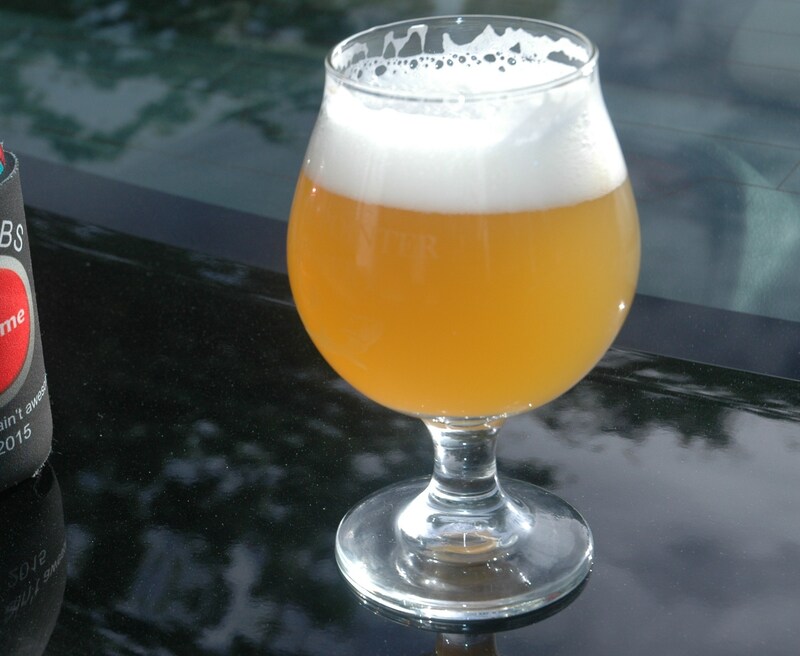 Appearance: This beers pours a golden light orange hue. It basically looks like fruit juice, super hazy. This is exactly like I want my IPAs to look. Its just a beautiful beer. The head sticks around nicely too! Smell: Huge hop aroma on this thing! I love what kegging has done for this beer. Heavy citrus flavor, more orange than grapefruit. Some tropical fruit, some peach, some berry, and a bit of pine. The Conan yeast leaves its peachy ester notes too. This yeast goes great with these hops. Taste: Very smooth bitterness, no real bite to it. The hop flavors consist of orange citrus flavor, tropical fruit, some mango, a bit of grassiness, and peaches. There’s just a bit of sweetness, but its more from the fruity hop flavors than the malt. Mouthfeel: This is where this beer stands apart from my prior IPAs. I really like the chloride heavy water profile on this as it really smoothed this beer out. The brew is medium bodied with medium carbonation, but it has a bit of creaminess that sets it apart from some of my other brews. Great stuff! Overall: I really couldn’t be happier with this one. This beer will be making a comeback for sure, I’ll just have to find a new name for it since my 527 changes every year! The heavy chloride ratio experiment really works here, and I plan on incorporating it into my hoppy styles rather than going heavy on the gypsum. There are a few changes I’d make though when I brew this again, but that’s just to differentiate it from my main DIPA, White Death. I’ll probably go 100% Pilsner malt then add a bit of caramalt for color. I’d like to try adding mango puree to this beer as well. I also wish I’d have tried Wyeast 1318 on this beer just so I’d have an idea how that yeast does with a DIPA. Again, thats all just to make it stand out from my other DIPA more since they use a lot of the same ingredients. The recipe was great as it stands now, so if you’re reading this and need ideas for a DIPA you can’t go wrong brewing this beer!